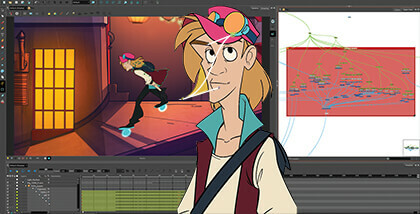 No matter the style of animation, Toon Boom can support it. Start in pre-production with Storyboard Pro and plan your production. 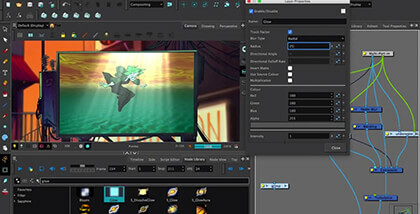 Then, seamlessly export your files to Harmony for animation in any style. Choose how you want to animate: 2d traditional animation on paper, paperless (digitally) frame-by-frame, or cut-out puppet animation. Throughout the process, track the status of the project and individual scenes using Toon Boom Producer. Toon Boom works closely with studios worldwide to enable them to produce the content the way they want, how they want it to look, on time and on budget. We can help achieve the style you want, whether you're drawing frame-by-frame or creating cut-out characters. You can also benefit from our expertise to surpass what you thought could be done with animation. Increase the quality of your work, while decreasing production costs. Created specifically for animation, the customisable Toon Boom Pipeline comprises Emmy winners Toon Boom Storyboard Pro and Toon Boom Harmony. Together, they cover the entire production workflow from storyboarding to final compositing, and deliver the highest throughput within the process. 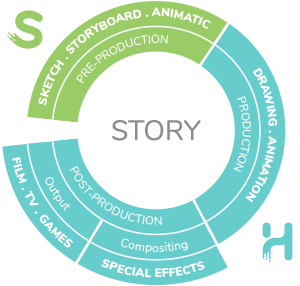 With Harmony, you can animate in any style they choose—from traditional animation to paperless and cut-out. Schools use Harmony to teach animation courses with the confidence that their students are using the same tools as the world's leading animation studios. It's everything you need to storyboard your episodic, advertising, film, or other creative projects. That is a priceless advantage. Hosted by Toon Boom CTO Francisco Del Cueto, this webinar will show you advanced tools and special effects capabilities in Harmony. Benefits of setting the correct workflow and demonstration of different ways to integrate the Harmony Solution to a Cut-out animation workflow.